The MSI Validation action enables you to perform Internal Consistency Evaluation on an existing MSI database. This action uses MsiVal2 executable, which is part of the Platform SDK Components for Windows Installer Developers. The MSI file to perform the validation on. The location of the ICE Database (.Cub) file to use. The MsiVal2 directory contains several .Cub files which can be used. 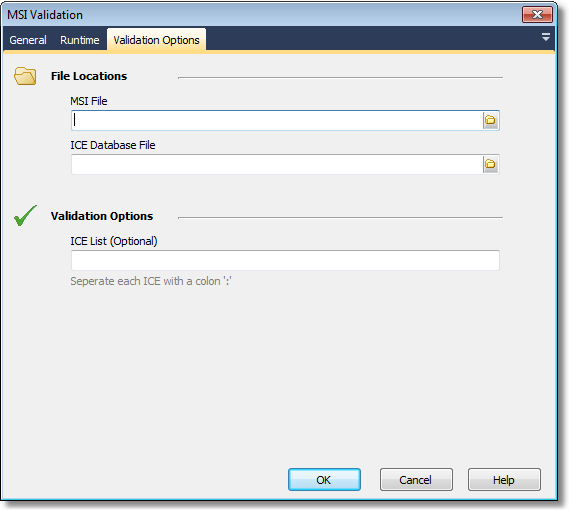 A colon delimited list of the required ICE Modules to be used when performing the validation.